Want to go shopping in Germany without blowing your budget? Then hit one of Germany's many outlet stores where you can find great bargains all year round. They have everything from designer fashion, jewelry, shoes, and household wares, often reduced up to 70% because they are either from last season or overstock items. Most German discount outlets are open six days a week (Monday - Saturday), but during Christmas holiday season, some of them open their doors on Sundays. Here are Germany's most popular discount and designer outlets where you can shop and save to your heart's content. Happy hunting! When the German brothers Rudi and Adolf Dassler both wanted to produce the perfect sports shoe in the 1920s, they created two of the most famous sports brands in the world: PUMA and Adidas. You’ll find the headquarters as well as the discount outlet stores of Adidas and PUMA still in the hometown of the Dassler family. Located in the small town of Herzogenaurach in Bavaria, 14 miles northwest of Nuremberg, you can find sports gear, shoes, and clothing at rock bottom prices. Decide for yourself whether PUMA or Adidas is the better fit – a feud that split the Dassler family forever. The Hugo Boss outlet store in Metzingen, 19 miles south of Stuttgart, is one of the most famous factory outlets in Germany. Hugo Boss, which was founded in Metzingen and still has its headquarters there, offers everything from business wear, casual wear and sportswear, to shoes, handbags, and accessories, promising savings between 20 and 70%. Bogner, Escada, Jil Sander, Strenesse, Reebok, and many other designers followed the example of Hugo Boss and opened their own discount outlets in Metzingen, transforming the city into a hot spot for the discerning, budget-minded shopper. You’ll find one of Germany’s largest open-air outlet centers in the town of Zweibruecken, in the southwest of the country. Shop in more than 64 designer stores at Ropenheim's The Style Outlet and save from 30 up to 70%. International brands include Calvin Klein, Diesel, Lacoste, Marc Picard Ralph Lauren, Svarovski, and Versace, just to name a few. Cafes, wine bars, fashion shows, and open-air concerts keep you entertained after your shopping spree while free wifi and free parking makes it easy. Just outside of Berlin, the city of Wolfsburg has a VW Factory with a wonderful auto museum fit for children and adults. It also has over 50 outlet stores arranged in an easy-to-shop city center along the river. 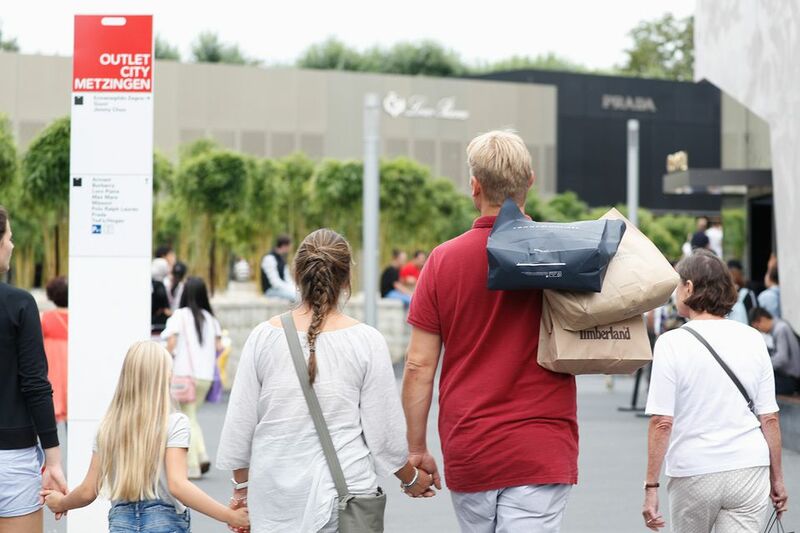 This is Germany’s first city-center outlet center and offers brand names and special open Sundays with more stores set to open in the future. The German Steiff toys are made only out of the finest materials, such as felt, mohair, or woven plush. They come with the traditional "button in ear" marking their authenticity and justifying the high price tag. You can get a much better deal if you travel to the birthplace of the Steiff toys in Giengen, 90 miles west of Munich. After visiting the factory shop, make sure to stop by the interactive toy museum and the workshops, where the plush toys are still made by hand. In Wertheim Village, 55 miles southeast of Frankfurt and close to the Romantic Road, you can shop in 100 different luxury outlet boutiques. Hunt for bargains from Aigner, Joop, Marc O’ Polo, Trussardi Jeans, Versace and many more. Prices are up to 60% reduced. Though the shopping area has its own charm, a shuttle bus connects the discount outlets with the true Old Town of Wertheim. It is a medieval village known for its well-preserved half-timbered houses. Germany’s first discount outlet store was built 6 miles west of Berlin. They sell over 100 international designer clothes and accessories from Prada, Tommy Hilfiger, adidas, Dolce&Gabbana, Versace, GUCCI, Mango, Nike, Replay, Levis, and Burberry. To refuel after a full day of shopping, there are cafés and restaurants, a children’s play area and baby-changing rooms, plus over 2,300 free parking spaces. Watch for late night shopping events which offer additional savings, cocktail bar with live music, a DJ and entertainment like a laser light show.